HP today announced a slew of new consumer computing devices that are available to buy now. The new computers don’t run Windows 10 out of the box, but will be upgradeable once the new operating system rolls out from 29 July. Here’s the low-down on the new models. This is a 1.2kg, 10.1-inch convertible device that features a magnetic hinge for one-step detachment, allowing the screen to be split from the base with a simple pull. The basic premise is that you can use it as a regular laptop, then rip off the screen as use it as a tablet (with a stated weight of 589g in tablet-only mode). Or, you could rip off the screen, turn it around in its hinge, putting it into an ‘entertainment’ mode. You could even turn it over and place it on a desk in ‘tent’ mode. Its different modes will be supported by Windows 10, with the operating system being able to optimise the environment for the mode being used. It has a dual-microphone array that has been implemented to facilitate better performance when using Windows 10’s Cortana personal assistant. Audio technology is by Bang & Olufsen, featuring two speakers made by HP, and some optimisations have been made to the audio to make it better, such as isolating the headphone jack from the rest of the components to reduce interference. HP Pavilion x2 hybrid tablet. Specifications for the Pavilion x2 include an IPS (in-plane switching), 1280x800-pixel screen, a quad-core Intel Atom Z3736F processor, 2GB of DDR3 SDRAM, up to 64GB of storage, a full-sized USB 2.0 port, micro-HDMI, and a microSD card reader for expanding the storage. Wi-Fi is 802.11n. Battery life is stated as being over 10 hours from a 2-cell, 33 Watt-hour battery, and there is a USB-C connector to facilitate power and charging. The Pavilion x360 is a convertible-style notebook, but it doesn’t have a removeable screen. Instead, it features a hinge that allows the screen to tilt all the way over to the other side of the base, allowing for the product to be used as a tablet, or in ‘entertainment’ and ‘tent’ modes, which will disable the keyboard. HP describes the hinge as having ‘three spiral gears for synchronised and precise movement’, which allows the unit to maintain the same thickness whether closed or used as a tablet. That thickness is stated as being 22.5mm. 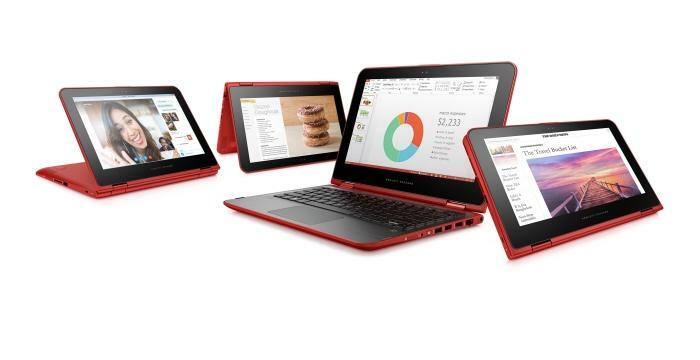 HP Pavilion x360s convertible notebook. Screen size is 11.6in, the resolution is 1366x768, and there are options for IPS and non-IPS displays. Processor choices include Intel Celeron, Intel Pentium, and Intel Core M, while RAM can be 4GB or 8GB. Storage options include 500GB or 1TB hard drives, a 500GB hard drive with an 8GB solid state drive cache, or a 128GB solid state drive. Wi-Fi can be either 802.11n or 802.11ac. B&O audio tech is present, there are two down-firing speakers, and there is a selection of ports that should make most PC users nod in approval. You get two USB 3.0 ports, one USB 2.0 port, a full-sized HDMI port, a full-sized SD card, an isolated headset port, and there is also a 100Mbps Ethernet connector. Weight is listed as being 1.46kg, and life from the 32 Watt-hour battery will vary depending on the configuration. Pricing starts from $699 for the Celeron version that has 4GB of RAM and a 500GB hard drive, and goes up to $999 for the version that runs Intel’s Core M-5Y10C, 4GB of RAM, and a 128GB solid state drive. Standard notebook computing is the calling card for these Pavilion models, which come in 14in and 15.6in sizes. These are straight up clamshells that have a thinner than usual design compared previous iterations. There’s no splitting at the hinge or flipping of the screen. For users with a phobia of low-resolution screens, the 14in notebook might be one to stay away from since it only comes with a 1366x768-pixel screen (with or without touch). The 15.6in model is also available in a Full HD (1920x1080) version (with or without touch). Configurations are plentiful, with both the 14in and 15.6in sizes available in 5th generation Intel Core i3, i5, and i7 guises, with graphics options including GeForce 940M or AMD R7 M360 chips, and maximum RAM being 16GB. Storage options are mostly hard drives from 500GB to 2TB, though there are also hybrid options. These laptops also feature an optical drive (DVD for the 14in and Blu-ray for the 15.6in). Networking includes 100Mbps Ethernet (not the faster Gigabit standard), and there are options for either 802.11n or 802.11ac Wi-Fi. There’s an SD card on each sized notebook, as well as two USB 3.0 ports, one USB 2.0 port, and HDMI. Pricing for these notebooks starts from $500 and there are many colours to choose from. The ENVY is a step up from the Pavilion notebooks, featuring a metal case and a more refined design. It’s HP’s premium laptop and is designed to be more elegant than the rest. You get a 15.6in screen, 5th generation Intel Core i5 or i7 processing, or even AMD FX and A10 processing. Discrete graphics is available in the form of NVIDIA’s GeForce 940M or GeForce GTX 950M, or AMD’s Radeon R6 or R7 graphics. HP designed the new ENVY to lift up a bit off the desk once its lid is opened, mainly to allow more air to circulate, but also provide a better typing experience via the backlit keyboard. Battery power for the Intel and AMD versions varies, with the Intel machines having a 55.5 Watt-hour power source, and the AMD machines having 48 Watt-hours. Overall weight is stated as being 2.37kg for both versions. Desktops have gotten some much needed love from HP, with the company releasing refined Pavilion all-in-ones that should appeal to users who want space-saving desktops with easy-to-manage cable arrangements. The new Pavilion All-in-One 23in and 27in models feature centralised cable clusters at the back, and the screen sits higher up than previous versions, giving a more natural feel. The speakers have been designed to use the desk surface for reflection, to improve audio performance. Speed is derived from either AMD or Intel processors, and there is a large range of configurations to choose from. A basic HP Pavilion Tower is available for users who want a conventional desktop computer with a monitor that they can attach themselves. Many colours are available for the Pavilion Tower, and there are even more configurations. It’s available with AMD or Intel power plants, with graphics power up to NVIDIA GTX 745, and storage up to 3TB via a hard drive. For gamers and other high-end performance seekers, the new ENVY Phoenix Tower desktop is the one to go for. It features Intel K-series unlocked and overclockable CPUs, as well as more powerful graphics and higher overall memory capacity and storage speed. A vertical stripe down the middle of the front panel is illuminated by a colourful LED, and HP claims that this can change depending on the ‘stress level of the PC’. It will shine redder when the PC is under heavy load, and bluer when the user is not doing much except for Web browsing. Left to right: HP Pavilion All-in-One, HP Pavilion Tower, HP ENVY Phoenix. Pricing for the 23in Pavilion All-in-One starts at $1299; for the 27in Pavilion All-in-One it starts at $1899. Meanwhile, the Pavilion Tower has a lower entry point at $1199. The ENVY Phoenix Tower has a yet to be determined price and will be available in October.